Balloon Gas is a safe, non-flammable, non-poisonous gas which is lighter than air. It can be used safely either indoors or outside. You should never deliberately inhale balloon gas as it is an asphyxiant. Store the cylinder in an upright position and secure properly to prevent toppling. Always keep the cylinder in a well ventilated area.Do not store in damp areas.Fire hazards and sources of heat should be avoided. In the event of a fire,vacate the area and call the Fire Brigade informing them that the cylinder of balloon gas is there. 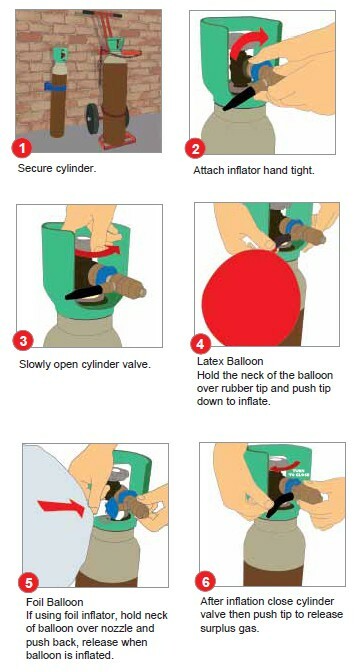 To avoid accidents,as balloon gas is stored at high pressure,the cylinder valve should never be opened without the appropriate filling kit attached and should be tightly closed when the cylinder is not in use. Ensure there is good ventilation when cylinders are carried in vans or cars and that cylinders are always secured during transit. You must always remove the filling kit if moving the cylinder any distance or ceasing to use it. Remember to turn off the cylinder valve and release pressure in the filling kit before removing it. Do not deliberately inhale helium – although not poisonous , it can result in suffocation. Keep all children away from cylinders and balloon filling apparatus. To avoid damage and potential accidents do not move cylinder with filling unit attached. Please return the cylinder when empty along with the filling kit. The cylinder and filling kit (unless the latter has been purchased) remain the property of the Balloon Man.